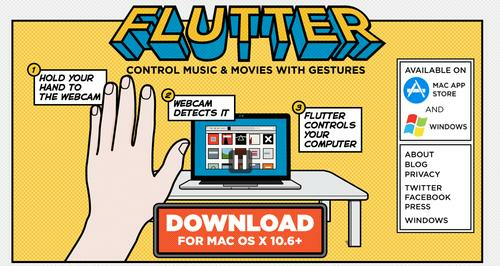 Google has acquired Flutter, a gesture recognition company whose technology lets people control music and movies on their desktop by waving their hands. Flutter makes an application for Mac and Windows machines that lets people control programs like iTunes and Quicktime by capturing gestures using the computer's webcam. "We will be continuing our research at Google," Flutter CEO Navneet Dalal announced Wednesday on the company's website. A Google spokeswoman said the company would be supporting Flutter's research. The deal has already closed and terms were not disclosed. Flutter's team will be joining Google's headquarters in Mountain View, California, to continue their research efforts. The Flutter app, however, will remain operational. Through an extension to the Chrome browser, it also works with Google's YouTube service, Netflix, Grooveshark and Pandora. Flutter describes its mission as being "to arm you with the superpower of Flutter so that you too can join the fight against unnatural user interfaces." The images captured by the webcam don't leave the person's computer and are not saved permanently, Flutter says. Its technology could potentially be incorporated into any number of Google products, such as its Chromebooks or head-mounted Google Glass system. Flutter launched in 2010, on a day when the keyboard and mouse were discovered to be "the greatest threat to human-computer interaction since carpal tunnel syndrome," the company said on its site.